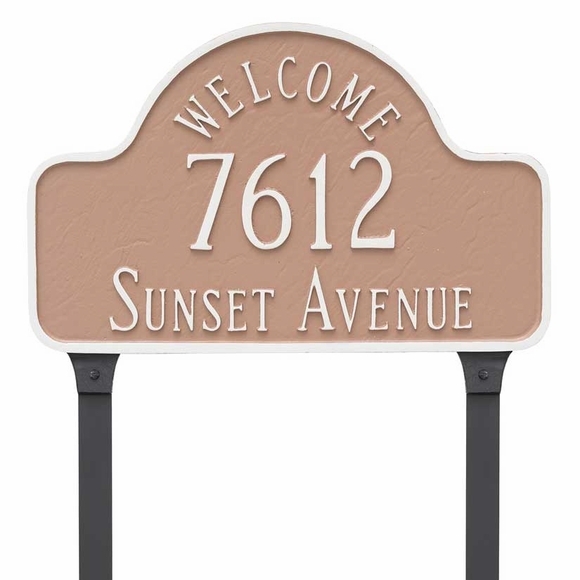 Welcome Arch Lawn Mount Address Plaque - - personalized two-line address sign with the word WELCOME displayed in the decorative arch above the house number. Made in USA. This sign is designed with integrated feet extensions and ships with two 24" lawn stakes. See Related Products for the wall mount Welcome Arch sign. Standard 15.75"W x 10"H holds up to five 3" numbers on Line 1 and up to seventeen (17) characters on Line 2. Large 20"W x 13"H holds up to four 4" numbers on Line 1 and up to seventeen (17) characters on Line 2. Estate 24"W x 15"H holds up to five 4" numbers on Line 1 and up to seventeen (17) characters on Line 2. This Welcome sign can also be purchased for Wall Mount (Comfort House item #: P2054). Well made , looks great and came quick!